There's a juicy "Vega" suprise in AMD's new mobile chip, too. 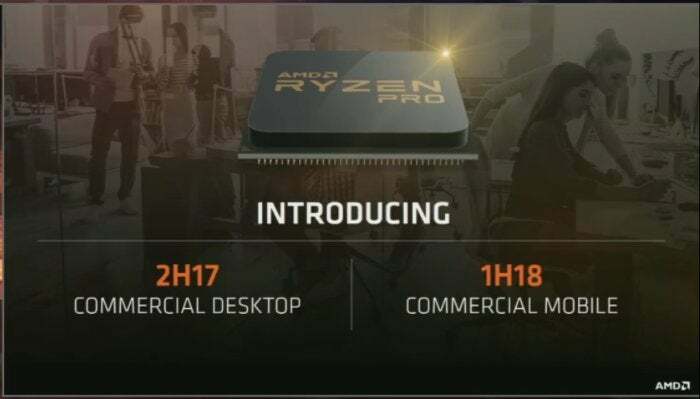 With the Ryzen 3, 5, and 7 chips already out the door for desktop PCs, AMD’s preparing its next assault: the mobile market, with a Ryzen Mobile chip that promises to outperform AMD’s current mobile processor by a whopping 50 percent. Announced at the company's financial analyst day Tuesday, AMD promises to offer a “phenomenal” gaming experience when the Ryzen Mobile chips launch in the second half of the year, both for two-in-one PCs and more traditional notebook computers. This is in part because their graphics capabilities are based on the upcoming Vega graphics core, AMD executives said. 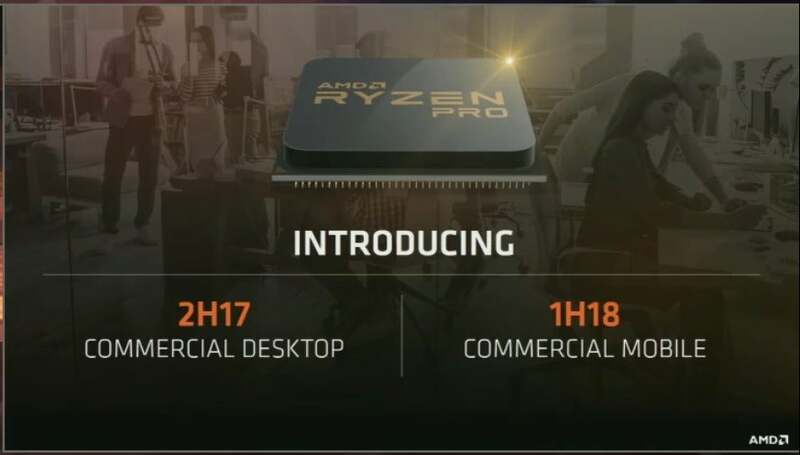 AMD also announced the Ryzen Pro, a version of the chip designed for commercial PCs. AMD’s processor roadmap for the remainder of 2017. 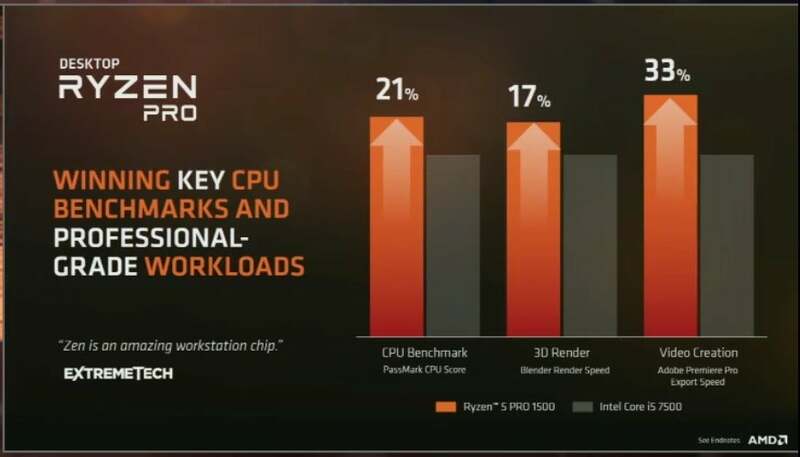 Why this matters: AMD’s sizzle included roadmap discussions of Ryzen Pro and the mobile Ryzen chip, as well as another massive Threadripper chip for gamers and the announcement of the Epyc brand for servers. The meat, though, was the message: AMD’s profits are expected to improve, in part because the company’s selling high-margin parts that gamers and other enthusiasts will pay big money for. 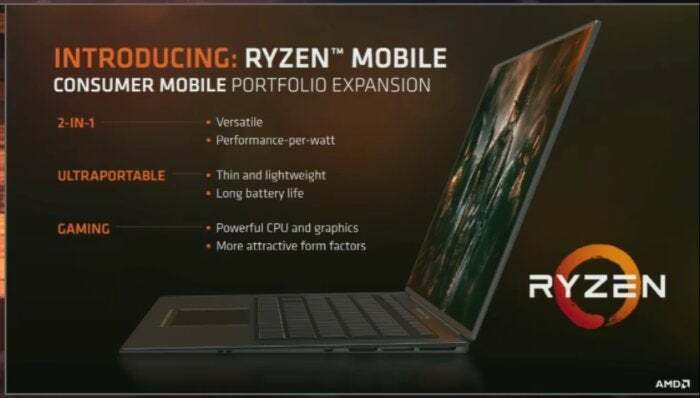 Most PCs are sold as laptops, meaning AMD’s existing Ryzen 3, 5, and 7 rollout for desktops was just a dry run of sorts for the real Ryzen launch: the Ryzen Mobile chip. Jim Anderson, the senior vice president and general manager of AMD’s Client and Computing Group teams, said AMD has already received a warm welcome from hardware partners. 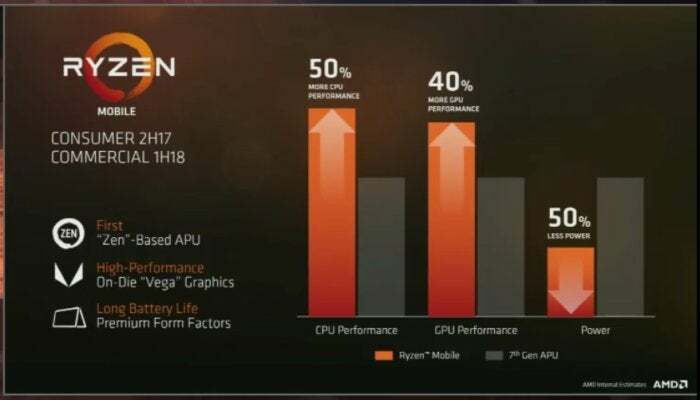 AMD is claiming a big advantage with the Ryzen Mobile over its current chips. “We’ve been working for months with the top [hardware partners] to bring new systems to market,” Anderson said. “So you’ll see with Ryzen Mobile beautiful two-in-one systems, some really beautiful thin-and-light ultraportables, great gaming systems." AMD hopes it can achieve all of that with some key elements. First, there’s the Zen core, which will provide the same dramatic leap in processor performance compared to the existing Carrizo mobile chips—over 50 percent, Anderson said. But there’s also a surprise hiding behind it: the first Vega graphics cores, which will deliver a 40-percent increase in performance over the current generation. Just as important, though, will be power efficiency: The Ryzen Mobile chip will operate at half the power of the current chip, Anderson said. While gamers may seek out AMD’s new Ryzen and Vega cards, the commercial PC market represents an important niche for AMD, too. Some customers prefer the look, feel, and price of a commercial business desktop, as opposed to a gaming machine. For this segment, AMD plans to launch the Ryzen Pro. AMD’s commerical chips will roll ourt over this year and next. 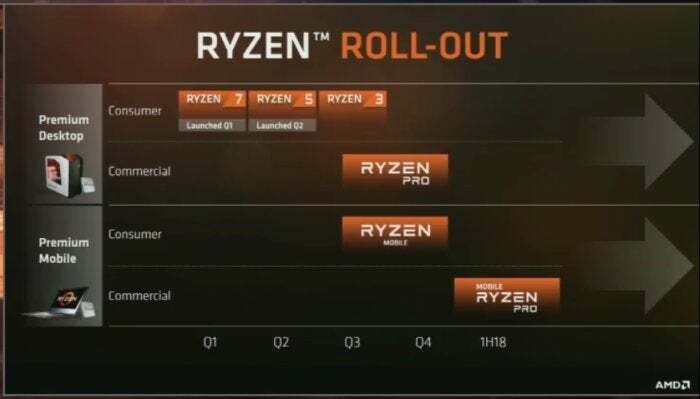 Here, AMD plans to leverage the existing success of the Ryzen line, adding an additional brand for the commercial PC space. All five top PC makers have Ryzen desktops planned, executives said. AMD didn’t say much about how fast the new Ryzen Pro chips would run, nor how much they would cost. Again, however, AMD believes they’ll compare well to what Intel offers. AMD’s taking aim at Intel’s Core i5 chips with its new Ryzen Pro series. According to chief executive Lisa Su, AMD believes that the combination of all of these products will help elevate the company above its prior reputation as just another budget chipmaker. “I believe with this product portfolio AMD can be one of the premier growth companies in this space,” she said.